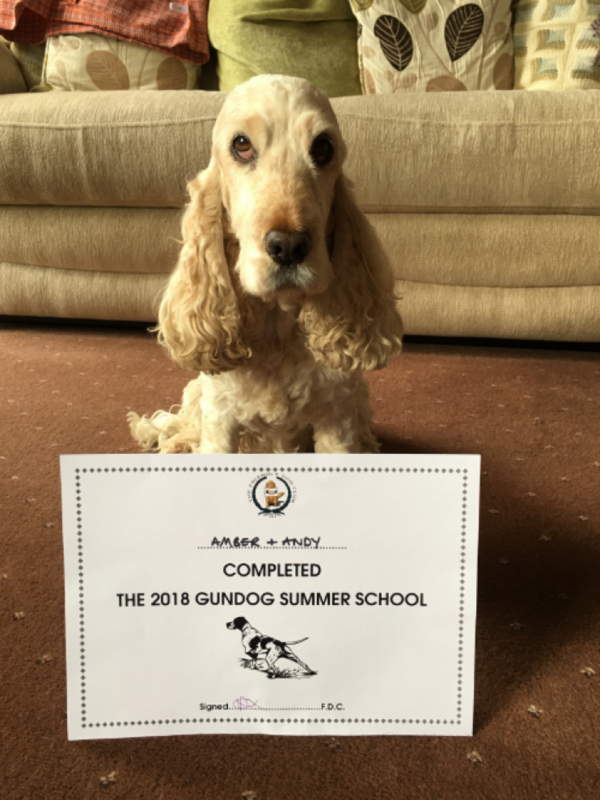 This is the final in a short series of articles about taking an introductory gun dog class run by The Friendly Dog Club over summer 2018. To see how we did from the start of the course, click here. It’s the sixth and final week of the summer introductory gun dog classes. Unfortunately this week it rained really hard for the first 15 minutes and so we had a delayed start and shorter lesson as a result. We can’t really be too downhearted as every other week it’s been dry. This is England, after all! Those of a squeamish disposition should look away now as this week we started by having another go at bolting rabbit, but this time with a real game bird. Our “pretend rabbit” was an ex-partridge (one that had shuffled off its mortal coil and gone to meet its maker etc). This smelly addition was most tempting for some of the dogs, however most successfully ignored the reanimated feathered missile as it was sent shooting across the grass at great speed. Amber sat looking at me and didn’t even glance towards the commotion this week, and as she was the first to go I was very pleased with her. Later we had a second turn, this time walking around the field with the bird being sent on its way as we got close to it. Again, no reaction from Amber. Good girl! Next we had a go at recall over quite a long distance. It was a mini knock-out competition with our hounds running two at a time with the winner of each progressing through to run against another dog. I was paired up with Briar, a working cocker spaniel, and her owner Kate with whom we attend the same regular class at the Friendly Dog Club during term time. Next up, we tried the memory retrieve. We walked around, dropping our target item in sight of our dog and then sending them out to fetch it. Everyone did well at this and some even tried with either the aforementioned deceased partridge or a similarly unwell pheasant. Amber had a sniff of the partridge but didn’t seem that keen to pick it up. It’s the first time she’s come across dead game so sniffing was always going to be her main choice of investigation. Will Amber ever be a fully fledged gun dog? As she’s a senior, most probably not. You may ask, therefore, why I did this course at all? The point is that I’ve really enjoyed myself and Amber has too. We’ve both relished getting out and about, meeting new people and dogs and just, simply, spending quality time with each other working as a team. What could be better than that? Owning a dog is brilliant. I’m pleased to report that the Friendly Dog Club are considering running further gun dog classes, most likely once a month for 2 hours. We’re hoping to join in with that as it’s been such huge fun taking this course, meeting the other owners and their wonderful dogs and, of course, enjoying the training from Gemma and her helpers, Kate and Rachel. I hope you’ve enjoyed reading these weekly updates. 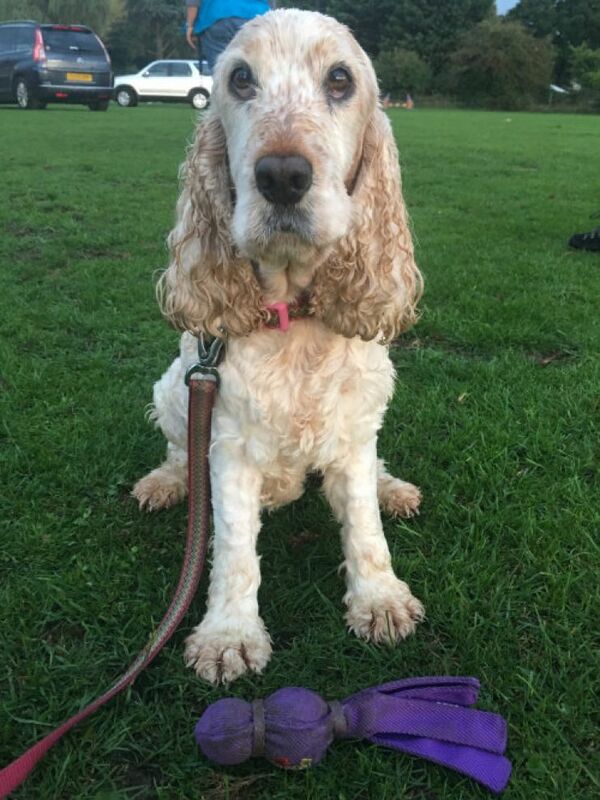 The Friendly Dog Club offer a wide range of activities for dogs (and owners) of all levels details of which are across the pages of this website, or you can phone or email to ask for more information. Whatever you do, there’s never any pressure in the lessons. The club lives up to its name.